how these processes are affected by differernt diseases and treatments. patients and the social healthcare system. tools for improving the quality of life and prolonging the patient’s lifespan. of various diseases in vitro and in vivo. O3(PZT), and (1–x) Pb(Mg1/3Nb2/3)O3-xPbTiO3 (PMN-PT). and providing great chance for building self-powered biomedical systems. 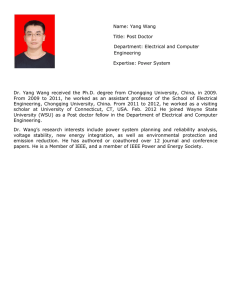 received his BS and Ph.D.
and Nanosystems as a postdoctoral research fellow. 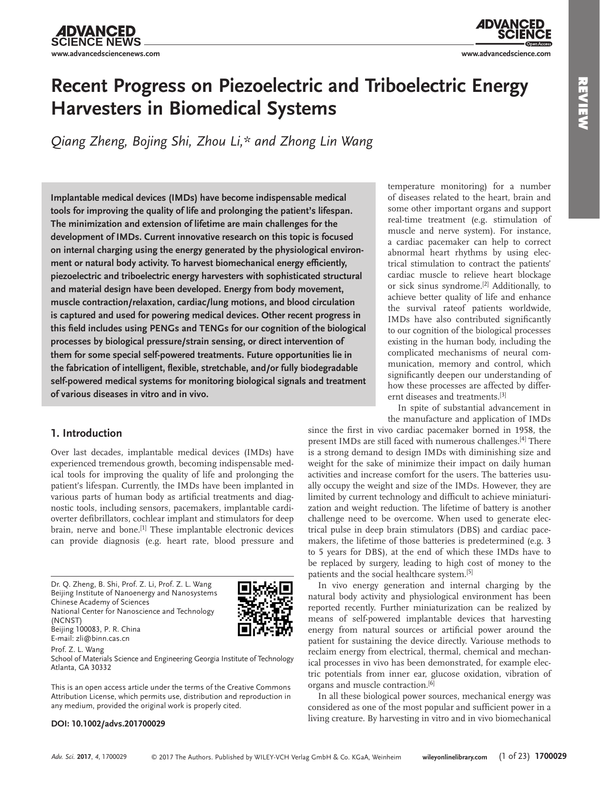 harvesters and self-powered medical devices, biosensors. Figure 1. Recent applications of PENGs and TENGs in biomedical field. between two materials can be molecules, ions and electrons. power for variouse integrated applications. closed, the electric potential created by triboelectric effect disappears and the electrons flow backward. electric dipole leading to a piezoelectric potential (Figure 2B). are material choosing and device structural design. surfaces, when two friction surfaces contacted (Figure 3B). mode and grating structured TENG. electrod of the TENG, which do not need to be electrically connected to the load, such as a human jogging on the ground. rotation mode. Harvesting energy from human walking, automobile and other moving objects is feasible and convenient. mode, and D) single-electrode mode. of integrated ZnO nanowires need to be further increased. NW array. Reproduced with permission. Copyright 2010, American Chemical Society. The lateral ZnO nanowire array was utilized in a sweepingprinting method to fabricate high-output PENG by Zhu et al. and was reported as 2 V in voltage and 50 nA in current. uniformity and periodicity of these nanowires can be well controlled by pre-sputtering a layer of seeds to the substrate. significantly enhanced, and meanwhile its durability and stability was exceptional good compared with former devices. hydrothermal decomposition, which covered in PMMA by spin coating. Reproduced with permission. Copyright 2010, Nature Publishing Group. D) Super-flexible ZnO based PENG with Al foil as both the substrate and the electrode. Reproduced with permission. bending and releasing, the BaTiO3 nanowires–PDMS composite device successfully generated about 7.0 V of output voltageand 0.36 µA of output current. a new PENG fabricated with vertical ZnO nanowires arrays. in the external load induced by an iterative mechanical deformation applied on the device. The output voltage and the corresponding current were up to 20 V and 8 µA, respectively. PENG and efficiency of converting the biomechanical energy. brushing the nanowires on two entangled fibers (Figure 5A). of 0.1V and power density of 16 µW cm–3. Similarly, Lee et al. average current density of 3.2 V and 0.15 µA cm–2, respectively. resulting in an output increase of the flexible PENG (Figure 6A). output performance of voltage, current density and power density were ≈2 V, ≈2.2 mA cm−2 and ≈88 mW cm−3, respectively. 0.03 µW of output voltage and power, respectively (Figure 6B). the ILLO process. Reproduced with permission. B) Thin-film PENG based on laterally-aligned PZT nanofibers. Reproduced with permission. nanoparticles were utilized to fabricate PENGs. Park et al. the device by mechianical bending or human body movements. and significantly increased the output power of PENG. 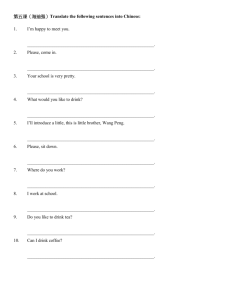 application for in vivo biological sensors and energy harvester. an in-plane poling process. The PVDF nanofibers were oriented by packaged in PDMS to form a flexible thin film device. between inhalation and exhalation process. PVDF based PENG was developed to address this issue. promising technique for integrating self-powered electronics. and current because of well-aligned electrical dipoles. of advanced materials also have been studied, including graphene, carbon nanotube, paper, nano-Ag ink, degradable polymers etc (Figure 7). stretchability, triboelectric properties, friction and their roughness in nano-scale might facilitate the application in TENG. output voltage and current density. Structure change will lead to an improvement of the output. advanced biomedical electronics for healthcare. 2012, the American Chemical Society. H) Graphene based TENG. Reproduced with permission. [56a] I) CNT based TENG. Reproduced with permission. J) Bio-degradable TENG. motion of relative sliding between two micrograting films. sliding mode TENG into a mouse pad or sliding panel. (Figure 7E). This self-charging power system shows wide applications to harvest all kinds of biomechanical energy and fabricate personal wearable self-powered electronics. but they still need reliable and safe energy sources to operate. them possible for biomedical applications. In 2009, Yang et al. with two ends affixed on a flexible substrate. Muscular movement drove the back and forth deformation of the whole device. the potential for active sensing of in vivo biological motions. directly from the movement of bovine heart and lung in vivo. example opened/close chest, awake and under anesthesia. cardiac monitoring system powered by iTENG. capacitor to 1.0 V within 40 s.
rat to harvest energy from its periodic breathing (Figure 8D). regime (10–100 kPa). Physiological activity in different positions of human body will generate differeent pressure signals. sports injuries in athletes and high-risk diabetic foot ulceration. them has its own advantages in sensing mechanisms. flexibility when processed into ultrathin films or nanowires. aluminum foil to generate a triboelectric effect simultaneously. coupled and increased the output performance of the PTNG. reach up to 97.41 mW m–2, compared with the TENG in control. The PTNG was further integrated with several power management components to form a packaged self-powered system. Play” mobile energy source by designing the universal connections of plug and socketfor the system. 100 light pulses when powered by a flexible TENG. Tang et al. TENG in complicated environment of living body (Figure 8E). Figure 9. Active pressure/strain sensor based on PENG and TENG. A) Conformal modulus sensor based on PZT. Reproduced with permission. TENG. Reproduced with permission. Copyright 2016, American Chemistry Society. changed by the direct piezoelectric effect under external force. the charge that accumulated between the semiconductor/dielectric interface. nanofibers. By the electrospinning method, a large-area freestanding P(VDF-TrFE) fibers was achieved in a flexible PENG. which could monitor small pressure about 0.1 Pa in minimum. calculated with the aid of a separate arterial pressure catheter. 2 weeks of implantation, proving suitability for practical use. great potential in the future of the healthcare industry. integrated on cloth or human body was increased. graphene transistor by dielectric ion gel effectively (Figure 9B). strain, which were promising for human-activity monitoring. and visualized blood pressure monitoring system. the wrist, neck and throat to monitor human blood pressure. which facilitate their biomedical applications. 5 W m−2 was delivered under the traditional compressive mode. pressure sensing and orients to the new generation of bio-integrated systems. device can monitor heart rates, reaching an accuracy of ≈99%. quite low power consumption and great strain sensitivity. sensor with better flexiblity and stretchability is crucial for biomedical applications. was simultaneously recorded by attached sensing electrods. of exciting the artificial cardiac action potential of the rat. medium for step-driven TENG pulse electrical simulation signals, which can induce MSCs to differentiate into neural cells. system for the assistance of nerve regeneration (Figure 10C). pressure of blood vessels can be converted into electrical power. orientation based on BD-TENG. D) A self-powered neural differentiation system with a step-driven TENG as the electrical simulation power source. Reproduced with permission. Copyright 2016, American Chemistry Society. diagnostic devices could be fabricated if integrated with a specially designed electrode or wireless transmission component. candidate for transient in vivo medical devices. the device will need to be embedded into a flexible, biocompatible package to be patched on or implanted into a patient. as the operating lifetimes and the absorption efficiency. program for pioneer researcher and his innovation team. S. L. Garverick, M. A. Suster, P. C. Fletter, M. S. Damaser, ACM J.
g) S. Garrigue, S. Boveda, P. Ritter, in Dawn and Evolution of Cardiac Procedures, (Ed: M. Picichè), Springer, Milan, Italy 2013, 253.
b) H. G. Mond, J. G. Sloman, R. H. Edwards, Pace 1982, 5, 278. M. Youseffi, R. F. Berends, N. Blagden, M. C. T. Denyer, Biosens. J. Kreuz, G. Nickenig, J. O. Schwab, J Cardiovasc. Electrophysiol. C. T. Stoeck, S. Vandenberghe, V. M. Koch, R. Vogel, Ann. Biomed. J. E. Kim, S. O. Kim, D. K. Kim, Z. L. Wang, K. J. Lee, Adv. Mater. Z. L. Wang, Nat. Nanotechnol. 2010, 5, 366; c) X. D. Wang, Am. Ceram. Soc. Bull. 2013, 92, 18. Z. L. Wang, J. H. Song, Science 2006, 312, 242. H. Zhang, H. X. Zhang, Nano Energy 2016, 22, 453. G. Zhu, R. Yang, S. Wang, Z. L. Wang, Nano Lett. 2010, 10, 3151. Environ. Sci. 2012, 5, 8970. Adv. Mat. 2014, 26, 4880. Z. L. Wang, Faraday Discuss. 2014, 176, 447. C. Zhang, W. Tang, C. B. Han, F. R. Fan, Z. L. Wang, Adv. Mater. H. Kang, M. Byun, W. D. Kim, S. Hur, S. H. Oh, K. J. Lee, Adv. Funct. Mater. 2014, 24, 6914. 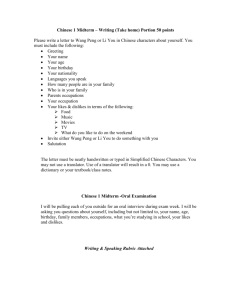 Z. L. Wang, Adv. Mater. 2015, 27, 1316. D. Y. Park, H. E. Lee, H. K. Lee, M. Byun, K. J. Lee, Energy Environ. 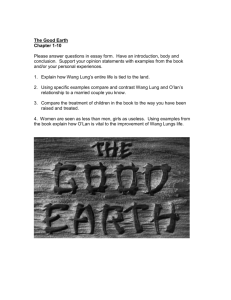 108; c) Q. F. Shi, T. Wang, C. Lee, Sci. Rep. 2016, 6, 24946. K. No, Y. S. Nam, K. J. Lee, ACS Nano 2013, 7, 11016. C. E. Chang, V. H. Tran, J. B. Wang, Y. K. Fuh, L. W. Lin, Nano Lett. J. E. Jang, J. I. Sohn, S. Cha, J. M. Kim, Nano Energy 2015, 16, 524. L. J. Chen, Z. L. Wang, Nanotechnology 2011, 22, 475401.
f) C. K. Jeong, K. I. Park, J. Ryu, G. T. Hwang, K. J. Lee, Adv. Funct. J. I. Sohn, S. N. Cha, D. Choi, Z. L. Wang, S. W. Kim, Nano Lett. C. Y. Kang, S. J. Yoon, Y. S. Kim, Adv. Mater. 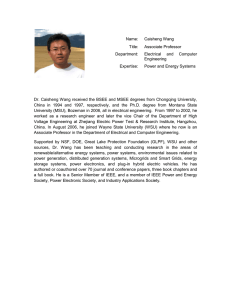 2012, 24, 6022.
b) S. Wang, L. Lin, Z. L. Wang, Nano Energy 2015, 11, 436. T. R. Kim, S. Lee, G. Schwartz, H. Chang, Z. A. Bao, Adv. Mater. L. Lin, H. Y. Guo, Z. L. Wang, ACS Nano 2016, 10, 4652. W. Li, J. Sun, M. F. Chen, Nano Energy 2014, 3, 95. Mater. Sci. Eng. R 2010, 70, 320. L. Lin, Y. Liu, Y. S. Zhou, Y. F. Hu, Z. L. Wang, Energy Environ. Sci. G. Zhu, J. Chen, T. J. Zhang, Q. S. Jing, Z. L. Wang, Nat. Commun. 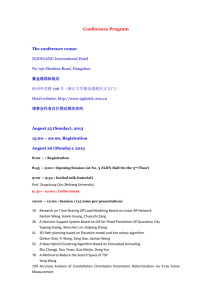 S. H. Wang, L. Lin, Y. S. Zhou, Y. F. Hu, Z. L. Wang, Adv. Funct. S. Xu, Y. Qin, C. Xu, Y. Wei, R. Yang, Z. L. Wang, Nat. Nanotechnol. Proc. Natl. Acad. Sci. USA 2014, 111, 1927. Y. F. Zhang, R. J. Saykally, P. D. Yang, Angew. Chem. Int. Ed. J. Goldberger, G. Somorjai, P. D. Yang, Nano Lett. 2005, 5, 1231. S. Y. Lee, J. M. Kim, Adv. Mater. 2010, 22, 2187. M. Mouis, Z. L. Wang, Adv. Funct. Mater. 2014, 24, 1163. Y. Qin, X. Wang, Z. L. Wang, Nature 2008, 451, 809. Z. L. Wang, Adv. Mater. 2012, 24, 1759. S. Xu, B. J. Hansen, Z. L. Wang, Nat. Commun. 2010, 1, 93. Nano Lett. 2011, 11, 1331. X. Chen, S. Y. Xu, N. Yao, Y. Shi, Nano Lett. 2010, 10, 2133. Sci. Rep.-UK 2013, 3; b) J. Cazaux, Appl. Phys. Lett. 2011, 98. Nano Energy 2016, 28, 172. Nano Lett. 2014, 14, 7031. 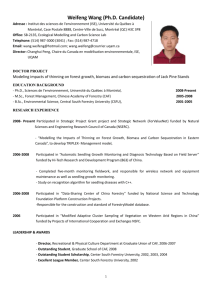 T. Zhou, C. Zhang, F. R. Fan, C. B. Han, Z. L. Wang, Nanotechnology 2014, 25, 225402. W. Tang, B. Meng, H. X. Zhang, Nano Energy 2013, 2, 1164. Z. L. Wang, ACS Nano 2013, 7, 3713. 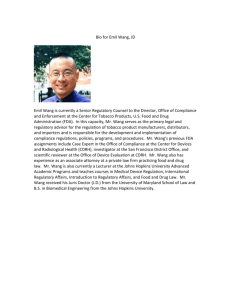 Z. L. Wang, Adv. Mater. 2014, 26, 3788. Adv. Energy Mater. 2015, 5, 1400790. 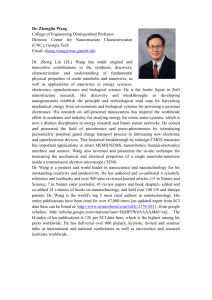 Y. Zhang, Z. L. Wang, Sci. Adv. 2016, 2, e1501624. Z. You, Y. Zhang, Z. L. Wang, ACS Nano 2016, 10, 6519. X. Sun, Z. L. Wang, Sci. Adv. 2016, 2. Z. L. Wang, ACS Nano 2015, 9, 7867. Z. Li, Z. L. Wang, Adv. Mater. 2016, 28, 846. X. L. Lang, Z. Y. Xu, Z. Li, Z. L. Wang, ACS Nano 2016, 10, 6510. Z. N. Bao, Nat. Mater. 2010, 9, 859. D. Platt, P. Bodo, S. Bauer, G. Domann, B. Stadlober, Adv. Mater. S. P. Lacour, B. Ploss, M. Zirkl, B. Stadlober, S. Wagner, J. Appl. S. Jeon, J. Bae, J. J. Park, N. E. Lee, Sci. Rep.-UK 2015, 5, 12705.
c) T. Sharma, K. Aroom, S. Naik, B. Gill, J. X. J. Zhang, Ann. Biomed. Eng. 2013, 41, 744. J. A. Rogers, Nat. Commun. 2014, 5, 4496. A. S. Tedesco, M. J. Slepian, Y. Huang, J. A. Rogers, Nat. Mater. Y. Zhang, Z. L. Wang, Adv. Mater. 2015, 27, 3817. Z. Li, H. Zhang, Nano Lett. 2016, 16, 6042. J. J. Park, W. J. Hyun, S. C. Mun, Y. T. Park, O. O. Park, ACS Appl. Mater. Interfaces 2015, 7, 6317. Q. Sun, W. Seung, B. J. Kim, S. Seo, S. W. Kim, J. H. Cho, Adv. Y. Zhang, Y. Liu, Z. L. Wang, Adv. Mater. 2011, 23, 3004. D. N. Rushton, Physiol. Meas. 1997, 18, 241. J. D. Weiland, Y. G. Huang, I. R. Efimov, J. A. Rogers, Adv. Mater. J. A. Rogers, Science 2012, 337, 1640; b) M. Irimia-Vladu, Chem. Soc. Rev. 2014, 43, 6470. S. C. Yen, C. Lee, Nano Energy 2017, 33, 1. T. E. Starzl, R. A. Gaertner, R. C. Webb, Circulation 1955, 11, 952. Environ. Sci. 2015, 8, 2677. (Ed: G. Gargiulo), InTech, Rijeka, Croatia 2011. Joint Surgery, American Volume 1985, 67, 577. Z. L. Wang, ACS Nano 2016, 10, 5086.